A lovely story about a lonely old woman and the items she loves. Cynthia Rylant introduces us to the main character and describes how she has outlived all of her friends and so she names inanimate objects now. She does not like the idea that she will be a lonely old woman without any friends to call by name. So she only chooses to name objects that will “outlive” her. She names her chair, her car, her bed, and her house. The objects become her friends. One day when she is out in her yard, a puppy stops by. Will the Old Woman resist the puppy or take the puppy in? Lesson Idea: Read aloud the beginning of the story up to the point where the puppy shows up. Stop and ask students, “What more would you like to know about the Old Woman and the puppy?” Record student responses. 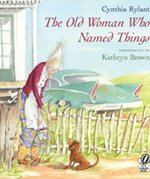 Students will wonder what will become of the relationship between the Old Woman and the puppy and will want to read on to find out, thus setting a purpose for reading. After reading, confirm student’s predictions.